To put it simply, I love dogs. To put it hyperbolically, I’m pretty sure that if my very existence could be explained with a Twitter bio, “dog lover” would be the first attribute noted. There aren’t, therefore, many things that can stop me in my tracks quite like crossing paths with a dog can. Free food, live music and obnoxiously good-looking people are honorable mentions, but seeing a dog is the most surefire way to get me to stop, shut up and look. In fact, my friends learned early on that if I break off midsentence, it’s not because I’m hurt or I suddenly remembered about a paper I forgot to write — it’s because I saw a dog pass by and I need to devote my full attention to it, if only for a few seconds. These serendipitous sightings seem to have an immediate effect on my mood, a feeling that is enlivening yet difficult to explain. At home, I was constantly surrounded by my five family dogs; it was only after moving away and being separated from my guaranteed daily dog dose that I began to wonder exactly why the mere sight of a random dog brought me — and many others — so much unadulterated joy. As it turns out, this commonly experienced emotional reaction to animals is no coincidence. According to an article published by Time magazine, a growing number of scientific studies have proven that the social support provided by the presence of animals of all kinds — including dogs — can have a calming effect, thereby reducing feelings of stress, fear and anxiety. Unfortunately, college students are rarely strangers to these mental health issues. From endless readings, midterms and essays to the pressures of having a job or participating in demanding extra curriculars, stress can seem omnipresent and palpable. Campus sophomore Jenna Waite is convinced than animal interaction can minimize the effects of some of these mental health concerns. She is also the president of De-stress with Dogs, or DWD, a club here on campus dedicated to providing students with the chance to pet, hug and just hang out with dogs in an effort to promote mental health. The club tables every weekday from 10 a.m. to 3 p.m. in an effort to give students a daily opportunity to have a relaxing moment with an emotional support or service dog. DWD focuses on accessibility, working to bridge the all too common gap between students and the comfort that dogs can provide. Between the cost of owning a pet and the general “no pets allowed” (excluding registered emotional support animals) policy within campus housing, students are often deprived of the comfort and affection from their family animals that they may have become accustomed to at home. Per UC Berkeley policy, any student requesting an emotional support or service dog to live in the residence halls must provide a series of documents to substantiate their request; these documents include a cover letter explaining the necessity of the animal, a letter from the student’s practicing medical professional as well as an agreement signed by all of the student’s roommates giving their consent for the animal to live with them. Consequently, it may be difficult for a student to receive the required permission to house the support animal. “It’s not always feasible for a student to have an emotional support animal or service dog,” Waite said. Waite also brings to the club two years of experience in training service dogs for veterans, an activity she became involved in during her senior year of high school after the loss of one of her family dogs. Waite detailed the ways in which owning a service dog positively affects the mental health and wellbeing of veterans with post-traumatic stress disorder, or PTSD. In one instance, Waite described getting a call from the wife of a veteran who was elated that — after years of restless nights — her husband was finally able to sleep with his service dog Rhemus at his side. “Just having this service dog in his presence allowed him to sleep through the night and know that, if anything was going to happen, the dog would alert him,” Waite recalled. It’s not just sleeping through the night, however — “It’s being able to function on a daily basis; it’s being able to actually concentrate and hold conversations with people,” Waite explained. She added that the companionship of a service dog often allows veterans struggling with PTSD to build a routine, find a new sense of normalcy and, in turn, improve their overall mental health and stability. According to the Time magazine article, the use of animal therapy is expanding in an increasing number of fields, especially in children’s hospitals, where animals were previously seen as a risk for infection and strictly prohibited. The positive effect interactions with animals can have on mental health, therefore, can be observed in broad array of individuals facing psychological challenges. 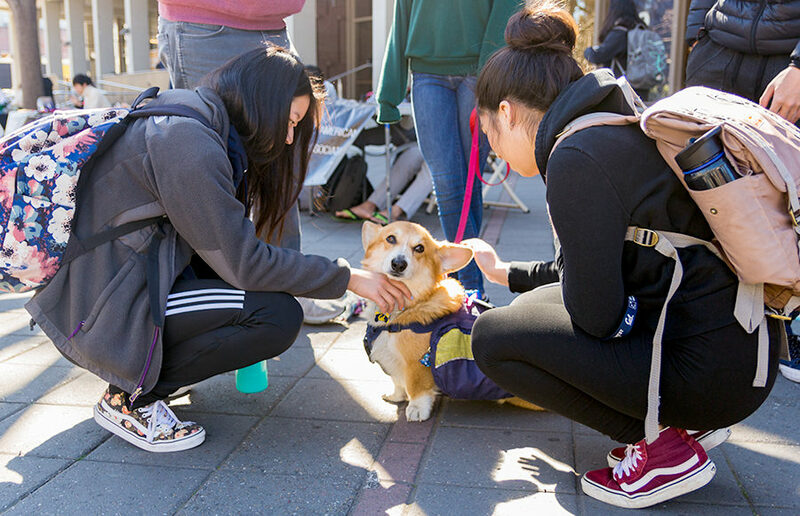 The efforts of institutions such as UC Berkeley to increase accessibility for students to support animals are not unrecognized nor unappreciated, but given the observable effect dogs can have on mental health, more can be done to expand upon this effort. Steps forward could be as simple as broadening the policy for animals in residence halls or funding more events that bring the animals to the students. Ultimately, one of the keys to better overall mental health on campus may be right in front of our eyes in the form of furry, four-legged creatures — and it’s our responsibility to utilize them. Contact Madelyn Peterson at [email protected].